Full of suspense, mystery, and drama, this thrilling page-turner opens with a young man siting perched at his laptop at a popular café in Paris de Amour when, all of a sudden, he catches the reflection of an unidentified shadow on his computer screen. He swiftly packs up his belongings and runs off into the crowded town hub, desperately trying to escape the shadowy figure stalking behind him! The young man’s name is Jake, but there’s a lot more to him than meets the eye. Jake’s true identity is that of a computer hacker associated with the infamous hacker organization ANONYMOUS! And so, there are numerous forces out to find him, some determined to expose him and others determined to use his hacking skills to their advantage. But regardless of their different motives, Jake’s hunters all have one thing in common—they’ll stop at nothing until they get what they’re after, making his journey full of unexpected twists and turns. 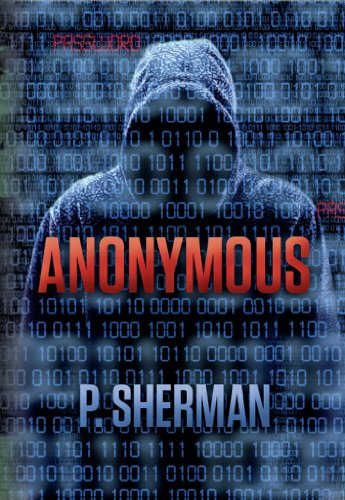 ANONYMOUS exposes the temptations and dangerous realities of modern social concepts, such as social networks and hacking organizations, while delivering a compelling story that will benefit the world we live in, making it a thriller sure to entertain you and keep you guessing until the very end! Author P. Sherman has generously chosen to dedicate a portion of net sales from this book to endorse the Ian Somerhalder Foundation (http://www.isfoundation.com), which, among other things, supports animals and helps recover their natural habitats from disaster and other unfortunate circumstances.